Each league has similar playing rules. This makes sense, since they are all based upon The Laws Of The Game. However, almost all leagues have slight variations in their application of the Laws. It’s important that you know the rule set for any league in which you are assigned games. Go to their website and brush up on their application of the Laws and note specific rule differences. 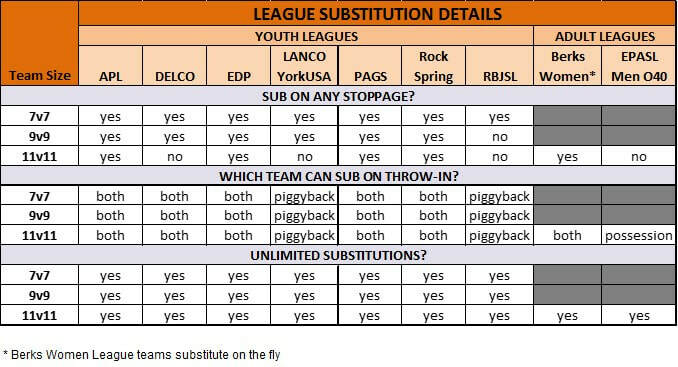 PAGS offers three different leagues, through the year; PAGS Premier Leagues (PPL), PAGS Developmental Geographic League (PDGL), and PAGS Cup Qualification League (PCQL). The difference between PPL and PDGL is that PDGL permits the use of guest players. PCQL is a short season league, consisted of three games that allow teams to get qualified for Cup play. PCQL games are generally played in November and December. PAGS permits both teams to substitute on any dead ball situation. Substitutions are unlimited and both teams can substitute on any stoppage. Pay particular attention to the league's substitution rules. This table shows slight variations between leagues.